Following Christ in changing lives through Global Eye Care Missions and Mentoring. We equip, enable, and train mentors in sight restoring skills and in Christ-like qualities through international mission endeavors, training camps & conferences, digital resources, networking, and devotionals, in order to give high quality vision care to the physically and spiritually blind around the world. Vision Outreach International began in 2001 through short-term mission endeavors. Since that time VOI has grown into a MAJOR advocate for helping the blind and the poor in under-served regions of the world. 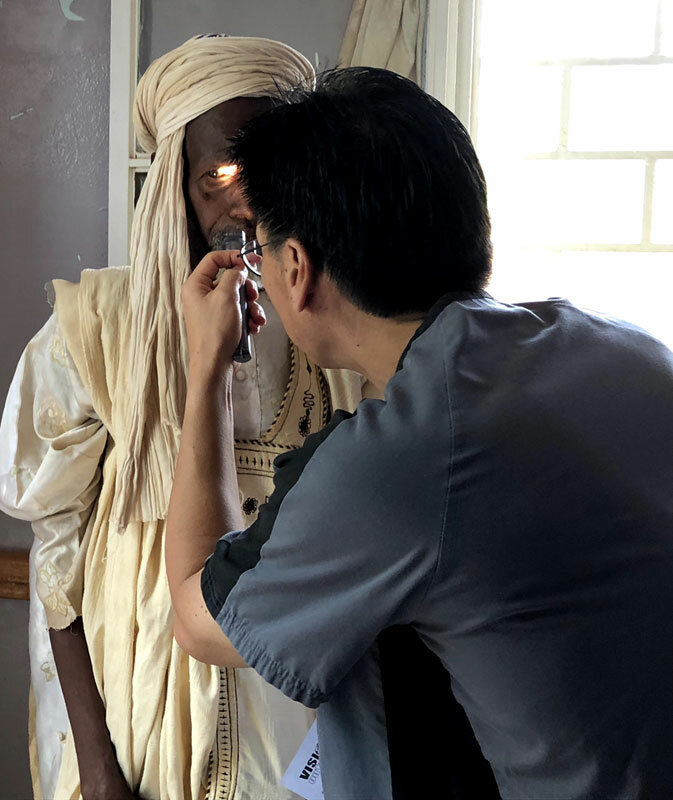 Not only do we send teams abroad, we develop ophthalmology surgical trainers and ancillary leaders who are encouraged to train others in the International MSICS (Manual Small Incision Cataract Surgery) technique. Through our Global Sight Alliance (globalsight.org) web portal, we develop a network of like-minded organizations, connecting quality eye care professionals with the greatest needs around the world. In addition, we have created an international network for collaboration and education through our web portal, which provide learning through multiple articles, webinars, and videos. The groundwork was laid well before David N. Brown, M.D. (OPH, 95), took his first trip to Kenya in 1998. After completing his ophthalmological residency at the Cleveland Clinic in 1995, he joined Great Lakes Eye Care, a Christian Ophthalmological group practice in St. Joseph, Michigan. If not for the group's "like-mindedness" and support, Dr. Brown says that he would not have been able to go to Africa. "The physicians at Great Lakes Eye Care have been a major factor in what I have been able to do," Dr. Brown says gratefully. “I've taken long leaves of absence, working overseas in the developing world. They have been a major support for me to being able to do that.” Vision Outreach International was birthed several years later. Vision Outreach International believes that the Nicene Creed articulates our basic and core beliefs. We are followers of Jesus Christ, with the hope to become more like Him in everything we say and everything we do. We believe in one God, Father Almighty, maker of heaven and earth, and of all things visible and invisible. And in one Lord Jesus Christ, the only-begotten Son of God, begotten of the Father before all ages, Light from light, true God from true God, begotten not made, of one essence with the Father, through him all things were made. Who for us men and for our salvation came down from heaven, and was incarnate of the Holy Spirit and the Virgin Mary, and became man, and was crucified for us under Pontius Pilate, and suffered and was buried, and rose on the third day according to the Scriptures. He ascended into heaven, and is seated at the right hand of the Father, and He will come again in glory to judge the living and the dead, and His kingdom will have no end. And in the Holy Spirit, the Lord, the giver of life, Who proceeds from the Father, Who together with the Father and the Son, is worshipped and glorified, and Who spoke through the Prophets. In one Holy, Catholic [Universal] and Apostolic Church. We acknowledge one baptism for the forgiveness of sins. We expect the resurrection of the dead, and the life of the age to come. A visual acuity of 20/20 with minimal-to-no pain and patient satisfaction is a quality outcome. Our desire is to exercise our skills in such a way as to do our best to accomplish this goal. Every patient is a valuable person and needs to feel valued while in our presence. By exhibiting Christ-like qualities of care, a patient should be encouraged during their time with us. We work with highly educated individuals with excellent skills. However, these qualities do not make us better than the “least of these.” Greatness is found in servanthood. Though we all have different roles to play, we look for opportunities to serve one another. It has been said, “Great Faith is seen when an authority is under authority.” This quality curbs our ambition for recognition and achievement by emphasizing the well-being of others and promoting their success above our own. We want to please Jesus in everything we do. Thus we strive to adhere to biblical convictions found in the Word of God. We choose to work with anyone without being judgmental. We simply trust God to lead us in setting the example for others to follow. We recognize that we do not have all the answers. This helps us maintain a teachable spirit as we network with others, transferring skills back and forth. We strive not to reinvent the wheel by starting everything from scratch. If others have “been there and done that”, we desire to gain their wisdom to project us further down the road and help us avoid the pitfalls which they already recognize. In Matt. 20:34, We see Jesus moved with compassion to the point of taking action to bring relief to someone who is suffering. The definition of the word compassion in this passage is “to be moved as to one’s bowels.” The bowels were thought to be the seat of one’s love and pity. When we think of this compassion, we imagine good parents who have compassion for their children. When a need arises, that parent will go to extreme measures to rescue their child from danger, protect their child from evil, or be with their child in pain. They have a compassion that moves them to action. This same type of compassion must be present for us to sacrifice our comfort, time, and resources to bring global healing to the blind in underserved areas of the world. It’s not a passion for the things we want, but a compassion for the people in need. There are three examples that we can use to illustrate the quality of tenacity extracted from 2 Timothy chapter 1. The first example is that of a good soldier. They are disciplined, teachable, dedicated, respectful, and under authority. They are focused on accomplishing their tasks with effectiveness and efficiency. The second example is an Olympic athlete. They work harder and longer than other athletes and give great attention to small details. Being faithful “to mind the small things” puts them at the top of their class. The third example is the hard-working farmer. Farmers work in harmony with the seasons and the weather. They are flexible, yet focused, knowing that certain things have to be done in a certain order to maximize future products. These three examples, with their multiple characteristics, help us understand what it takes to advance to the highest level possible. While compassion gives us a LOVE FOR PEOPLE, tenacity gives us a LOVE FOR PROCESS and high quality gives us a LOVE FOR PLEASING GOD with the best we can accomplish. All are equally important in providing vision for this world and the next. It takes HUMILITY to understand your role and how it changes. Everyone has something they can teach and everyone has something they can learn. No one is an expert in every area. Encouraging transparency and soliciting feedback, with a heart of HUMILITY, will help the entire organization to grow in wisdom and in favor with God and man. If someone offered you a 30-day job for either $1000.00 a day, or a penny on day one with that pay doubled each of the next 29 days, which one would you choose? The first represents the power of addition, but the second demonstrates the power of multiplication. The first equals $30,000.00 at the end of 30 days. , should you have chosen the second, your month’s pay would have been $10,737,418.23. It’s not how fast one does the work, but how well the work is done. Each student should strive to perform their work as well or better than their teacher, with the thought of frequently reinvesting their skills in the lives of others over the course of time. To the extent we are able to accomplish this, will determine our effectiveness in eradicating needless blindness around the world.